The Milgram experiment focused on the power of obedience to authority. There have been many controversial experiments in psychology history, including Milgram’s classic obedience experiment. The experiment was considered so controversial, in fact, that most assume that such a study could never be carried out today thanks to ethical guidelines, institutional review boards, and concern for participant welfare. Yet Milgram’s experiment and his results have been replicated several times in recent years. Why Replicate the Obedience Experiments Now? How Was the Study Different from the Milgram Experiment? In Milgram’s original experiments conducted during the 1960s, participants were asked to deliver electrical shocks to a “learner” whenever an incorrect answer was given. In reality, the learner was actually a confederate in the experiment who pretended to be shocked. The purpose of the experiment was to determine how far people were willing to go in order to obey the commands of an authority figure. 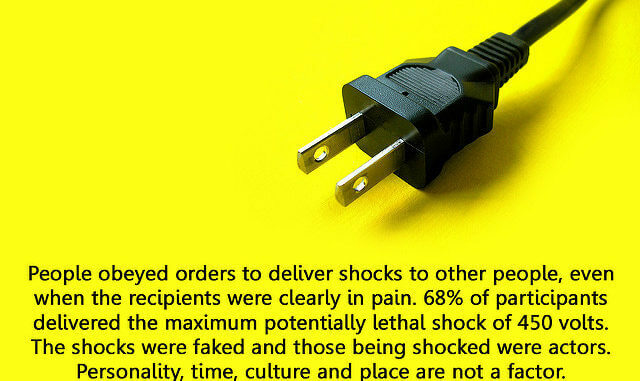 Milgram found that 65% of participants were willing to deliver the maximum level of shocks despite the fact that the learner seemed to be in serious distress or even unconscious. Recently, Jerry Burger, a psychology professor at Santa Clara University, replicated Milgram’s famous study with some modifications to address the ethical concerns of study. The challenge, Burger explained, was to come up with a version of Milgram’s procedures that still provided useful comparisons to the original study without posing risk to the participants’ well-being. Initially, Burger himself believed that replicating Milgram’s study simply wasn’t possible. To deal with the ethical concerns over the research, he made several alterations to the original experiment. First, the maximum shock level was only 150-volts, much lower than the 450-volts Milgram used in his experiments. The researcher also carefully screened the participants in order to eliminate anyone who might have negative reactions to the study. Participants were asked if they had ever been diagnosed with a psychiatric disorder, experienced trauma, suffered from stress-affected medical conditions, had problems with drugs or alcohol, or took any medications for emotional difficulties. Those who responded yes to any of these conditions were dropped from the study. The remaining candidates then completed measures of depression and anxiety before being screened by a licensed clinical psychologist. After carefully screening the participants, the remaining subjects were repeatedly told that they could quit the study at any time and still receive the $50 they were promised for participating. With consent of the subject, each participant received a very mild, 15-volt electrical shock. Following the experiment, participants were quickly debriefed and told that the “learner” was simply pretending and had never really received any electrical shocks. Finally, the experimenter was also a licensed clinical psychologist who put any end to any sessions where undue stress or anxiety was observed. The results of the new experiment revealed that participants obeyed at the same rate that they did when Milgram conducted his original study more than 40 years ago. The research remains controversial, but Burger has suggested that much can be gained by further exploring remaining questions in this area using his modified 150-volt procedures. Burger J. Replicating Milgram: Would People Still Obey Today? American Psychologist, 2009;64(1):1-11. doi:10.1037/a0010932. Elms AC. Obedience lite. American Psychologist. 2009;64(1):32-36. doi:10.1037/a0014473. Miller AG. Reflections on ‘Replicating Milgram’ (Burger 2009), American Psychologist. 2009;64(1):20-27.